Diamond candle holders provide a touch of luxury. A diamond tealight holder can bring a touch of elegance to any setting. Whether you are looking for a tealight holder that is cut like a diamond, shaped like a diamond or with the sparkle of a diamond, this can be a stunning type of candle holder. Tealights are a very versatile type of candle. These small, yet distinctive candles come complete with a metal container which makes them ideal for many different types of candle holder. The metal container holds the molten wax which means that the tealight can be placed in glass and crystal candle holders without fear of the wax spoiling the sparkle. Diamond tealight holders can be the perfect way to combine the beauty of tealight candles with the elegance of glass and crystal. A tealight candle holder shaped as a diamond is very attractive. These candle holders can be displayed on their own or grouped together for added effect. The diamond shape works well with tealight candles as the candle flame gives an inner sparkle to the candle holder. An alternative style of diamond shaped candle holder is a tealight candle holder shaped as a diamond ring. This is perfect for engagement parties and wedding celebrations, and can also make unusual party favors. One way to replicate the inner beauty of a diamond in a candle holder is to look for a glass or crystal candle holder that is faceted. 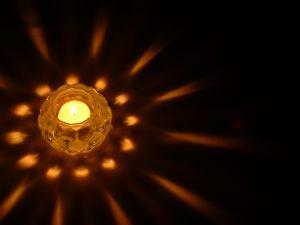 The flame of the tealight dances around the different facets creating a stunning room accessory. There are many different shapes and sizes of faceted crystal candle holder available, meaning that there is bound to be a suitable style whatever the setting. A diamond tealight holder must sparkle. In addition to faceted crystal tealight holders, many others styles of diamond candle holders have added sparkle to replicate a diamond. This might be through the addition of glass or crystal beads, special shaping, the use of mirrors or by a range of other features. Diamond tealight holders can be displayed in many different ways. One of the most attractive ways of displaying these pretty candle holders is as a centerpiece design. This can be a stunning accessory in both formal and informal settings. Diamond tea light candle holders work well in contemporary and traditional styles. The candle holders can be dressed up further by the addition of other accessories such as petals, beads and ribbons. Some diamond candle holders can be displayed in chandeliers, lamps or other displays. Tealights are available in plain white and also in a wide variety of colors. They are also available in both scented and unscented versions. Scented tealights are ideal for home fragrance. This means that different types of tealight can be chosen depending on the setting or occasion. A scented tealight combined with a diamond candle holder can help to give a special ambiance to a room. This could be useful for creating a romantic or relaxing atmosphere. Plain white unscented tealights are the most economical form of candle and these can often be purchased in bulk which represents a significant cost saving. When using a tealight candle in a diamond candle holder a plain candle is often perfect for the job as the candle holder is the object of beauty. With a little care a diamond tealight holder can give many years of service. In order to keep the candle holder looking its best, however, it is important to keep it clean. A regular wipe with a soft cloth will remove any dust or grime that will stop the candle holder from shining. Crystal candle holders should be cleaned in accordance with the manufacturers instructions. Diamond tealight holders should be stored carefully when they're not in use. Not only does this help to keep them clean, but it also helps to ensure that they do not get damaged. Diamond tealight candle holders are often made from glass or crystal and this means that they can be fragile and susceptible to knocks or other damage. Candle holders should also be regularly inspected as any cracks or damage could result in the candle holder breaking or shattering. This could be a safety hazard. A diamond tealight candle holder will give many years of pleasure. These beautiful accessories are likely to be much admired and will be the talking points of many occasions.